It was another disappointing year for P&G shareholders. 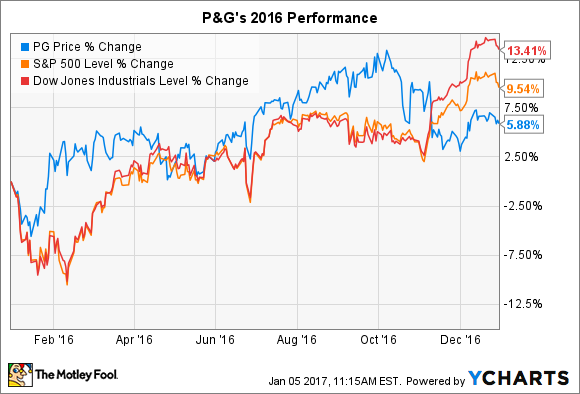 Procter & Gamble's (NYSE:PG) stock failed to keep pace with the broader market in 2016, rising 6% compared to a 13% spike for the Dow and a 10% increase for the S&P 500. The consumer goods giant made important progress during the year, but ultimately, it wasn't enough to offset its sluggish sales growth in the eyes of investors. Below, we'll highlight P&G's biggest 2016 wins and losses and see whether the company can finally break its streak of underperformance in 2017. P&G started the year off on a sour note. Yes, its first quarterly report of 2016 included a return to organic sales growth following a rare decline in the prior quarter. However, those gains came entirely from price increases and not increased demand. Sales volumes fell overall even as P&G's 3% organic uptick trailed Kimberly-Clark (NYSE:KMB) and Unilever (NYSE:UL), which each grew 5%. Like its rivals, P&G's operations were hurt by geopolitical weakness across the globe. But its heavy exposure to volatile markets like Russia, Ukraine, and China put it in an especially tough spot. Meanwhile, dramatic swings in foreign currencies, especially in Venezuela, produced major, if temporary, drags on both revenue and profit. The company struggled on the execution front as well. In the fiscal year that closed in August, P&G posted its second straight year of market share declines as it failed to defend against the challenges posed by global rivals and by retailers aiming to push their in-store brands at P&G's expense. Its annual organic growth pace fell to 1% from 2% in the prior year, meaning the company did not hit its overall growth goal. In response, P&G plowed ahead with what management called the biggest transformation in the company's 179-year history. It completed the shedding of over 100 brands from its portfolio, including such cherished franchises as the Duracell battery business and the Coty line of beauty products. The aim, executives said, was to create a faster-growing, more profitable company that was easier to manage and could more quickly respond to changing customer preferences. P&G paired that portfolio-shrinking strategy with a massive cost-cutting effort. Both initiatives succeeded -- at least in meeting their short-term objectives. The company now manages just 65 brands across 10 categories. And, like Tide for detergent and Gillette for razors, the remaining franchises were picked for their dominant market shares and unusually strong sales and profit growth potentials. As for costs, the company found great success in squeezing efficiency out of its already world-class operating structure, removing $2 billion of expenses from its annual cost burden. These moves weren't enough to spark strong profit growth, though, so P&G posted its second straight year of declining core earnings in 2016. However, cost cuts and brand divestments raised a massive amount of cash for the business that management could dedicate toward supporting its brands through innovation, advertising, and sampling programs. Given those constraints, it's no surprise that shareholders received their weakest dividend raise in modern time. P&G did its best to make up for that disappointment by showering investors with cash returns through stock buybacks. P&G now has the slimmer portfolio and cost structure it wants, but that doesn't mean it's smooth sailing from here. Kimberly-Clark and Unilever both noted at their last quarterly check-ins that the consumer products industry slowed recently, with the growth pace heading toward zero. As a result, P&G will need to find a way to outpace its rivals in what promises to be a weak sales environment. On the other hand, the company sees organic growth improving to a 2% pace in fiscal 2017. Its last quarterly report of 2016 included an encouraging uptick in sales volume and even hinted at market share gains in important categories like shaving. And cash returns should continue flowing to investors, mainly in the form of stock buybacks. Still, it's unlikely P&G will break out of its 3-year stock price funk until it begins clawing back big portions of its lost market share.